Hard sole cushioned slippers. Machine washable. Color is Black. Multi Density cushioning system. Sweater knit upper with 2 button detail. Faux fur lining. Indoor and outdoor use. 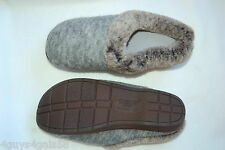 Dearfoams Sweater Knit 2-button Boot Slippers. Sweater knit upper with 2 button detail. Faux fur lining. Indoor and outdoor use. Upper: 65% Acrylic, 35% Polyester. Lining/insole: 100% Polyester. Outsole: TPR and Fabric. High Top Bootie Slippers. Lower part is mock suede, upper part is knit. Chestnut Brown. Adjustable lace above ankle. Lightweight velour lining. Sparkle Knit-Top Booties. Foam-lined faux suede lower. Sweater knit with gold & silver sparkles (mylar thread woven in) upper. Color: Tan with multi. Machine washable. All man made materials. Sole: 100% Thermoplastic-Rubber Machine Wash Cold Water. You can wear these in or outdoors. Perfect as they. Shoe Lining Material: Polyester. XL 11-12. Size Chart for Dearfoams. You can wear these in or outdoors. Perfect as they. Shoe Lining Material: Polyester. Sole: 100% Thermoplastic-Rubber Machine Wash Cold Water. Dearforms active at home clog slippers. Size 8. Dearfoams Black Boot Slippers. Faux Fur with Gray Fold Down Option. Machine Washable. Clog style, knit dye. New in box. Indoor or outdoor use. Machine washable, dry flat. Treat yourself or a loved one to these plush knitted slippers. Our cozy fleece lining and faux fur cuff are the perfect combination for comfort. Slippers run a size smaller. 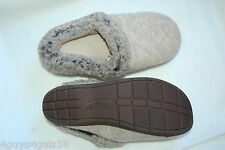 Dearfoams Tall Boot 1 Button Cuff Slippers. Enhanced insole with high density foam for underfoot cushioning. Multi-layered foam cushioning. Sweater knit fabric upper. Care: Gentle machine washable.